TYLER, John (1790-1862) was the tenth President of the United States from 1841 to 1845 after briefly being the tenth Vice President (1841); he was elected to the latter office on the 1840 Whig ticket with President William Henry Harrison. Tyler ascended to the presidency after Harrison's death in April 1841, only a month after the start of the new administration. He was a supporter of states' rights, and as president he adopted nationalist policies only when they did not infringe on the powers of the states. His unexpected rise to the presidency, with the resulting threat to the presidential ambitions of Henry Clay and other politicians, left him estranged from both major political parties. Autograph Letter Signed “J Tyler” 1pp. 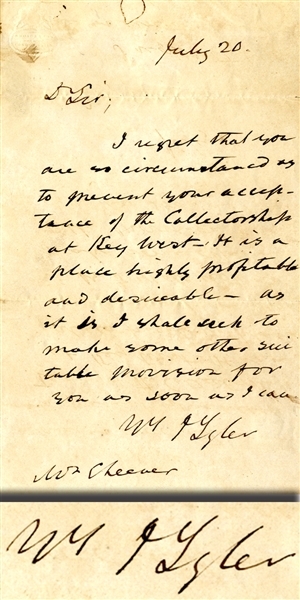 octavo, July 20, addressed to Mr. Cheever, and reads in most part: “...I regret that you are so circumstanced as to prevent your acceptance of the Collectorship at Key West. It is a place highly profitable and desireable, as it is I shall seek to make some other suitable provision for you as soon as I can...” Fine condition.